It’s hard to not be amused in a toy store, no matter a shopper’s age or interest. Village Toys at the Shops at Heavenly Village only proves this point. Their store holds an emporium of goods to dazzle both the young and young at heart. 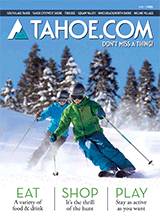 Shop for board games, puzzles, stuffed animals, arts and crafts, vintage toys, books, videos, Lake Tahoe souvenirs and much more. They carry products from brands like Legos, Barbie, John Deere and others. If a toy store weren’t enough to get you excited, they also have a candy shop so that you can complement the experience with a sugar rush.